Ever wanted a Blu-Ray DVD player in your living room, an iPod nano in your pocket, or a TomTom in your car? 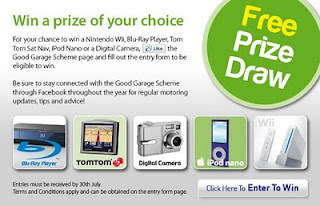 Well this is your chance to win a prize of your choice with the Good Garage Scheme. Today sees the launch of a six week free prize draw on Facebook, which fans of the Good Garage Scheme page are able to enter. Simply ‘like’ the Good Garage Scheme on Facebook, fill out the entry form, and keep up to date with our motoring tips, updates and advice for your chance to win. Draw is open to all fans of the Good Garage Scheme and Good Garage Scheme member garages. Draw closes July 30th and Terms and Conditions apply.